Operating at speeds of up to 45 pages per minute (letter) the imageRUNNER 3245i is a powerful multifunction device that allows small businesses and workgroups to take advantage of their network infrastructure and speed their business communications. 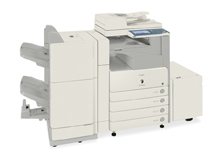 The imageRUNNER 3245i is a compact MFP with a smart design and innovative integrated accessories that enables the system to be placed in areas with limited space. With standard digital copying, network printing capabilities, and black-and-white and full-color document distribution capabilities, the imageRUNNER 3245i makes a great impression every time. Plus, with support for USB Memory Media, your workflow productivity will not slow down as you can scan documents in color to USB memory media, or print documents stored on your USB memory media. Why settle for less when the imageRUNNER 3245i model is well within your reach? From copying to scanning, printing to storing, and sending to customizing, there's no better solution for workgroups and small offices. Delivering output at up to 45 pages-per-minute (LTR), the imageRUNNER 3245i is powered by Canon's imageCHIP II system architecture, helping the device to achieve exceptional performance with faster processing and support for more sophisticated features. This architecture leverages dual processors designed to drive image processing onto a single chip to allow for highly efficient processing of multiple functions simultaneously, while providing an additional Accelerator CPU to increase performance speed. The imageRUNNER 3245i provides a standard dual RAM capacity of 1GB RAM + 256MB RAM (1GB RAM + 768MB RAM max), and Canon's innovative MEAP (Multifunctional Embedded Application Platform) technology for customized workflows. Experience standard support for high speed full color and black-and-white scanning. Whether you need to capture a single page, or scan reams of paper, the imageRUNNER 3245i model can quickly create electronic versions of your original documents. To unlock the full potential of the imageRUNNER 3245i model, the control panel has been designed with a new TFT touch screen, providing a wider viewing angle and greater contrast to facilitate easier operation. > A standard 100 sheet capacity Duplexing Automatic Document Feeder makes scanning multi-page and different sized originals quick and easy, with a scan speed of up to 51-ipm in both Black-and-White and Color. With a standard paper capacity of 1,150, upgradable to a maximum of 4,950 sheets, the imageRUNNER 3245i has been designed to meet the volume requirements of small businesses and workgroups. With the standard Color Universal Send Technology, users can quickly distribute scanned documents to multiple network destinations, such as e-mail and Internet fax addresses, local Mail Boxes, fax, network folders, and WebDAV servers - in a simple operation. Scanned documents can be sent in TIFF, JPEG, PDF, or XPS format. Advanced and Security send features such as PDF/XPS Compact, Searchable PDF/XPS, Trace & Smooth PDF, Encrypted PDF, and Digital Device Signature PDF/XPS are all supported as standard. The imageRUNNER 3245i provides standard support for Canon's proprietary UFR II print technology, as well as popular PCL 5e/6 and PS 3 emulation page description languages. Support for up to 1200 x 1200 dpi print resolution provides professional reproduction of text and images. The imageRUNNER 3245i can be equipped with Super G3 fax capabilities with support for up to 3 fax lines for the ability to transmit faxes at impressive speeds. Portable USB memory devices have become part of the everyday workflow in many office environments. The Canon imageRUNNER 3245i model can now become a part of that workflow with the ability to directly print from, or scan in color to USB memory media, with support for PDF, JPEG, and TIFF file formats. For a quicker and easier way to type information at the device, such as send-to destinations, file names, User ID's and passwords - the external USB Keyboard (optional) allows you to operate the imageRUNNER 3245i model's keyboard functions instead of using the touch-screen control panel. With the Wireless LAN connectivity option, connecting you imageRUNNER 3245i model to a local area network has never been easier. For wired environments, 10/100/1000 Base TX Ethernet comes standard. Protect your device against unauthorized use with flexible user authentication methods. One of these methods is Single Sign-On (SSO), where users can be authenticated on the device using their corporate network credentials. This new version of SSO no longer requires an additional security agent, and takes advantage of the robust security features of Kerberos Authentication. The optional Access Management System allows system administrators to define privileges to users, or groups of users and can now be integrated with SSO. These privileges can be used to restrict access to certain functions such as print, scan, fax, copy, USB media access, and many more. A number of features are available as either optional or standard to protect your most critical information. Features such as Encrypted Secured Print, Encrypted PDF, and Digital Device signatures help protect documents, while the HDD Data Erase and Encryption kits and Removable HDD Kit help to protect the information stored on device's internal Hard Drive. Network security consists of MAC/IP Address filtering, as well as new support for IPSec and IEEE802.1x (Wire/Wireless). Canon has developed a number of technologies that promote resource conservation. The imageRUNNER 3245i model is ENERGY STAR qualified and uses less than 1W in Standby mode. Canon's RAPID Fusing System, which is more energy efficient than conventional systems, also allows for quick start-up times. A number of features such as two sided, image combination, and preview before print help save consumables such as paper and toner.